Flaunting dauntingly rich hues and entrancing intensity, Blue Spinel has been the go-to gemstone for all the lovers and collectors of regal jewellery. Matching to the great demand, TJC brings you an exciting collection of jewellery studded with them! 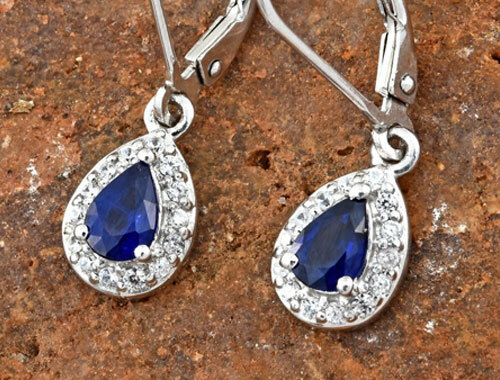 Blue Spinels have always been regarded with luxury and regal ambience. It is also why the jewellery made of these stones is almost always eloquent and fancy in style. Having always been confused with rubies or sapphire, the stone holds a very deep and hypnotizing colour. Needless to say, it was the aesthetics that got it to be confused with sapphire for a very long while. Spinel is an abundant stone and can be found in various places peppered throughout of the world. Having said that, most of the procurement of this particular variety is done from Myanmar (Burma.) Some parts are also imported from Tanzania, in the foothills of Mount Kilimanjaro. It is exciting to know that it shares it site with tanzanite, one of the most royal stones in the catalogue. The spinel collected from Burma is considered to be of a higher grade and a better quality. But there have been some portions from Africa that have been excellent in all their visually aesthetic appeals. Everything withstanding, the supply from Burma has always been stable, consistent, and of a high grade. Spinel is a stone available in a wide array of exuberant colours and grades. From red, to pink, to orange, and yellow, you can find almost all sorts of shades in this stone. However, finding a blue spinel is a rare and pricey occurrence. The rich cobalt blue hues of the stone make it a much-desired stone, which as a much higher demand in the market than the supply. The short natural supply of the stone in the market is the reason why we present a diffusion-treated spinel of the highest possible quality. Now, the process of diffusion that we have taken on is not very easily spotted in the current markets. It is also the reason why the stone is one of the most expensive varieties of spinel in all its colours. In this process, a small amount of cobalt is injected on the surface of the gem, which makes the colour more intense and dark. The final colours of the stone may range from grey to violet-blue, greenish-blue, or cobalt-blue. The lighter shades have a better clarity and sparkle in them, while the darker shades look much more promising and exotic. As mentioned above, TJC makes the naturally-occurring spinel undergo a special diffusion treatment, which promises to make the colour more rich and precious. Other than that, the gems also undergo intensive heat treatment. This treatment is to rid the stone of cloudiness and other imperfections found on the surface. It also makes the stone immune to higher-than-average temperatures. In the later stages, the stone is also polished, like all others. It is primarily done to bring out the sparkle of the facets, so they shine more brightly and make their presence known. As of recent changes and additions, Spinel has been added to the birthstone list. It can now be found under the month of August, right along with peridot. Hindu relics say that it is considered a replacement for sapphire, not just in terms of its physical attributes, but because of its healing properties. The stone holds the power to provide mental peace to the wearer, along with happiness and wealth. The simplest way to take care of the stone is to just wash it with warm water and a little soap. The gems go under various treatments, so any kind of ultrasonic cleaning can have undesired effects. After washing the stone, you can dry it with a soft towel or use a soft chamois cloth for the same. Keep it away from any sort of harsh stimuli that can harm the surface. Blue spinel has always been confused with sapphire. In fact, in many places, it is also considered as an easy replacement for sapphire as it is much cheaper in comparison but holds almost the same colour and clarity. It ranks 7.5 to 8 on the Mohs scale of hardness, which means that it is strong and can withhold accidents. It cannot easily shatter, but it is susceptible to scratches and abrasions, which might harm its shine. Spinel is also considered to be the traditional gift for the 22nd Anniversary. Although found in the naturally-occurring sources, spinel goes under a treatment process to bring out the dark and impressionable cobalt blue hues. The treatment is rare and is done in a only a few places. The stone has the best and the most consistently high-graded supply from Burma.